hands on answers could provide a real step toward peace. For example, as a citizen of this solar system, your daily portion of our Suns energy output is equal to receiving a five foot cube of gold daily. So don't let anyone tell you your worthless. To convert that energy to useful power there are a number of ways. Simple steam engines, stirling engines, new low cost solar cells or solar refrigeration. For example, solar dishes can be used to focus solar energy on to solar cells, greatly increase their energy output at little cost. The goal of this project is to make these alternatives available through low cost kits, plans and how to video's which can soon be seen on You tube and Google video's. The next logical energy system could be from pockets of frozen gas that have been found on the ocean floor in a state of frozen gel. This created by the oceans pressure and coldness. This gas can easily be released with a bit of heat. A few years ago the volume was estimates to equal all the known oil reserves. Now their estimating ten times that amount and a number of companies are gearing up to tap and deliver this clean nature gas. The system is ready to go, considering that most homes and factories are already connected to a gas line and its easy to convert cars and trucks to run on clean natural gas. But at the same time you can't beat free sunshine, so this nature gas may simply be used as a back up system for cloudy days. Many wars, past and present have been fought over water. So we need to apply some good answer now. 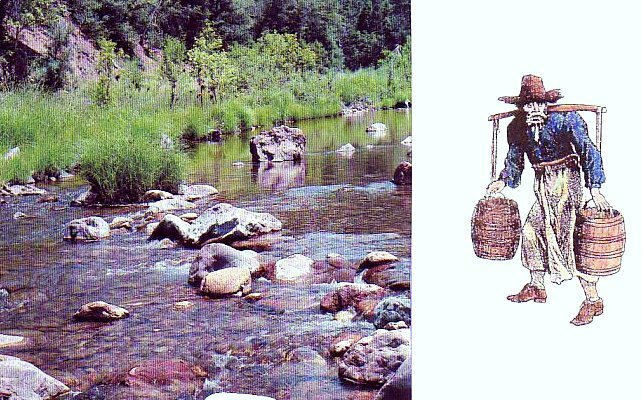 Water is critical for survival and in the past, even if you had water, there were problems. Too close and you'd get flooded out and too for away, you could not carry the needed water. And then even if you had a good location, others were waiting to take over your land. One of the main reasons for today's expanding population is low cost pipe that can deliver a reliable water supply. But looking at the big picture, the lack of water is just poor planning, when considering that all the lakes and rivers of the world represents less then 1% of the worlds oceans. So then one the greatest things we can do to secure a good future is good water management. For example, before the railways our ancestors built canals and today with modern equipment we'd have no problem channeling spring flood waters into storage area's to water farmlands in the west plus grow fuels and projects could be set up worldwide, it just takes some organization. Is there really a world population problem? 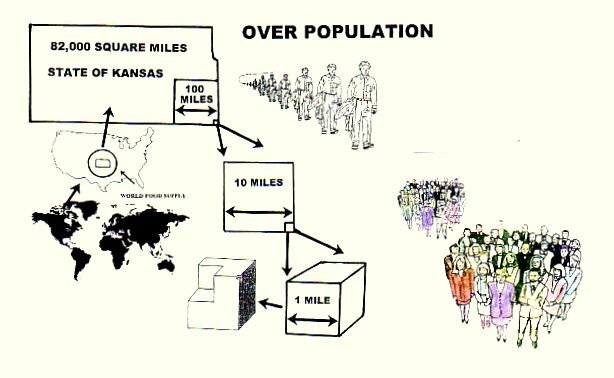 Looking at the numbers, the earth is covered by 200 million square miles, of which 50 million square miles is land and all of the worlds population could fit into a box just 1/8th of one square mile, as shown in the drawing. So there is no real problem that the right ideas can not solve? Our Creator told us that if we'd follow his laws, then there would be no sickness. You'll remember that in the Garden of Eden, folks lived a 1000 years and ate fruits and nuts. Also there wasn't mush to worry about. Added to that the atmosphere contained more oxygen and moisture which filtered out a lot of radiation. So how to get back to the Garden of Eden? One method is to obey our Creators law's. For example, we are to canceling all debts and let the land rest every seventh year. Now why were these two laws put side by side? Because a farmer free of debt has both the time and motivation to build up the fertility of his soil, creating a nation of healthy people. Also plants grown in good soil have better resistance to bugs and can better withstand cold or dry spells. These two rules also provide for generations of economic growth and stability. How to make soil. The elements are unlimited, all you need is rock, water, sunshine, earthworms, bacteria and so forth. For example, if you pour water on rocks, it runs right off, where as cellulose, like news papers or the bodies of bacteria, act like sponges to hold the water. From there you add in the earthworms that will carry died vegetation into the soil to feed bacteria and other life and you've created soil. So then, if nothing else in life, at lest make more dirt. Earthworms can produce 11 times the potash, 7 times the phosphorous, 5 times the nitrates, 3 times the magnesium and 1-1/2 times the calcium as found in normal soils, so earthworms are extremely valuable. Another example. Ten pounds of earthworms in just two years can multiply to a level where they can create enough soil and minerals to feed 20 people. Also note that 40% of our fuel is used to raise food, such as plowing up millions of square miles of fields each year, is a job that earthworms could do a large part of. Note also that mineral rich soils not only provides the building blocks our bodies need but also some of those minerals help to clean the junk out of our bodies. So, how to convince folks to rebuild our nations soils? One of the first thing to do is put the -S- back on the word sabbath, as found in the Ten Commandments (#4) which should read, to keep my Sabbaths, which also includes the weekly Sabbath of your choice. This will get the farmer's out of debt and provide the rest time needed, by the life within to build rich soil. Also we should add an earthworm count, stamped on every food package to show the average number of earthworms per squire foot of farm land on which that product was raised. The process would offers proof that no poisons were used plus giving the buyer a good idea of the mineral, richness of that food. And no fancy equipment is needed or even to change any of the labels. The number could simply be stamped on along with the date. Consider also the more earthworms, then the easier it is to plow the soil and the less fertilizer is needed which means the less oil we need to import. To put minerals back into our farmlands, there are some 50 cement companies scattered across America, which are capable of grinding up rock and all located next to railroad tracks, making it easy to deliver the powered rock directly to all parts of the country, where the railroads also pick up grains and so forth. As for the cost of having the cement companies grind up the rock and the railroads haul it? That cost would easily be off set by the reward of healthier people, less sickness, less days off the job, equals lower workmen's compensation cost. Plus expanding future market's. These advantages alone should make the service free. Here's a new clean way to use nuclear energy along with cleaning up the old waste. This system is called a Pebble Ball System. The balls are the size of tennis balls and made of a mixture of Carbon and Uranium and then encased in two layers Carbide Tungsten. What's great about this system is that each ball is self regulating, which means that it's temperature will only raise to a curtain point, then just sit there until its energy runs out. And you can't make bombs out of this system. In operation the balls are placed in the top of a tank and a gas like nitrogen picks up the heat to create steam for a power plant. Then from time to time the balls are removed from the bottom of the tank, one at a time and tested for energy levels. If still good, they go back into the top of the tank and if not they can be put into another tank, working at lower temperatures, as an example to covert sea water to fresh water. Then after that, lower levels they could be used for heating buildings or summing pools. There are different types of radioactive materials that could be adapted to this system and all the old waste material could be recycled through this system. Then when all the usable energy is squeezed out, you simply put it back where you got it. To create the nuclear fuel the dirt and other elements need to be removed because they create too much space between the uranium to make it effective. So to get rid of the waste, just mix the dirt back in. 50% of Boeing's new jetliner is made of carbon fibers. Why? Because these micro fibers are 100 times stronger then iron. And in the near future cars, boats and perhaps homes will be made out of these carbon fibers. 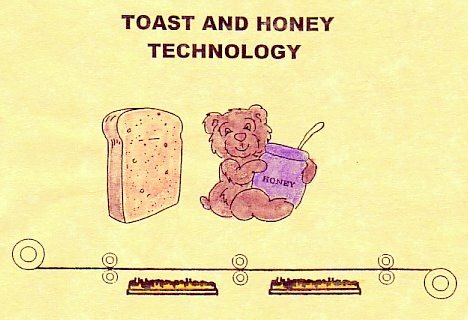 Why call this toast and honey technology? Because the carbon of the burnt toast is the main ingredient and sugar is the main ingredient of the resins that glue the fibers together. How do you make it? Just take any sting and cover it with tar or carbon from burnt toast. Then burn the string in a hot oven, without oxygen to prevent combustion. What happens is at high temperatures, the carbon atoms vibrate so fast, that they push out impurity's and at the same time connect together creating ribbons which also connect side be side. This process also looks simple enough for cottage industries, which opens up many possibility. This carbon fiber process is also another good example of the Universal Grid at work. We may call this next age the diamond age? We had the stone and iron age, now were coming into the carbon age. Diamonds are made of carbon, so the diamond age is a good title for this new age. An age when we start doing things right. Henry Ford was one of the first to use plastics in cars and the method was simple. Just heat up any oil and pump air through it. This drives out the solvents and oxides the oils. What's left is a plastic that can be molded around man made or natural fibers to create all sorts of stuff for cottage industries. For recycling plastics there are a number of ways, one is to divided up the types of plastics by the code stamped on the bottom. Another way is to chop up the plastic, then in water the more expensive plastics will sink. Also a mix of different plastics can be heated in a rotating drum to create a general use plastic, such as for creating water pipes for reclaiming the deserts, or for making molds. In just recycling the plastic's we use today we'd have the needed material to solve many of the worlds problems. For making molds using sheets of plastic, a combination of heat and vacuum can be used to create many shapes. For example, jacuzzi's are molded this way. these simple molds can then be used to create many of the needed items for more self sufficiency. Another system using foam molds, can produce precision parts, at low cost and is ideal for cottage industries to create many needed items for real independence. The process is simple. 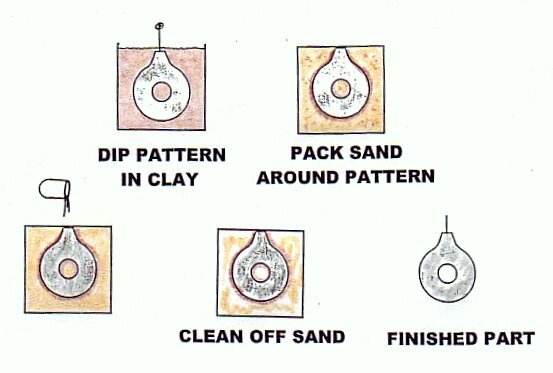 A foam pattern, like a foam cup, is dipped in clay, then packed with sand and dried. Then when the metal is poured in, the foam disappears, leaving a perfect copy, requiring little or no machining. The square in this picture of America represents the expansion of the worlds deserts over the last 50 years, some 250,000 square miles. Compare that with the red dot at the bottom of the square which represents the cars of the world, equaling 25 square miles. The numbers make it clear that the expanding deserts have much more to do with global warming then the cars. So then, besides making cars more efficient, we also need to start replanting the deserts and other hot climate with more vegetation. Many deserts are close to an ocean where wave action could be used to pump sea water though piping made from recycled plastic. Then use the heat of the desert to evaporate that water for cooling and which can be absorbed by the leafs of plants to establish vegetation. Also there's a good market for sea salt. 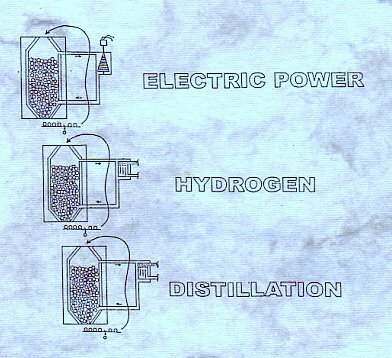 Vacuum distillation is another real answer. The process needs to start by replanting the desert on the same side where it started from or from which ever direction the wind blows. $1000.00 per acre, that's about $50 trillion dollars worth of real state or equal to the worlds total wealth today. It is estimated that underground coal mine fires in China have consumed some 200 million tons of coal and in India some 10 million tons of coal, which is equal to all the gasoline used in America. So what can be done? One answer might be, to pump sea water into the mines, which will produce steam and distilled water. Then use old steam turbines out of ships or convert old jet engines into steam turbines for generating electric power. That way you get electric power and fresh water from sea water and you do not need to dig the coal out of the ground. The way to get rid of acids or pollution is to spray lime water into the exhaust gases. Better gas mileage. There's a new system of running gas engines by injecting gas on one cycle, then water on the next. This converts the waste heat into steam pressure. Cooling the cities. Most of the worlds cities are located next to oceans or lakes and if you go down in the water 50 feet, it's ice cold. Most cities also have storm run off systems that could be used to pump that cold water to buildings for cooling. Also in many cases, the wave action could do the pumping for free. For cooling home's In many areas where the winters are cold it is also easy to reach cold ground water that can be used for cooling in the summer time. This by using a simple pump at 1/20 the energy cost of running an A.C. unit. For dry climates, there are some great new evaporative cooling systems, that cost next to nothing to operate. For heating homes in the winter, you can make your swimming pool into a large compost pile. Then use a small pump and loops of plastic tubing and an old car radiator to transfer that heat into your home. Then come spring you have lots of compost and the pool can be cleaned for swimming. The life within the soil, bacteria, earthworms and so forth all produce acids as a by product and in time causing the soil to become too acid. The common method of solving the problem is to burn of the corp residue, which leaves the ash which is very alkaline and neutralizes the acid. (Tums for the soil) Another answer would be for the farmers to make the crop residue into logs to be sold as winter fuel, then send the ash back to the farms, or use part of the profits to buy lime. 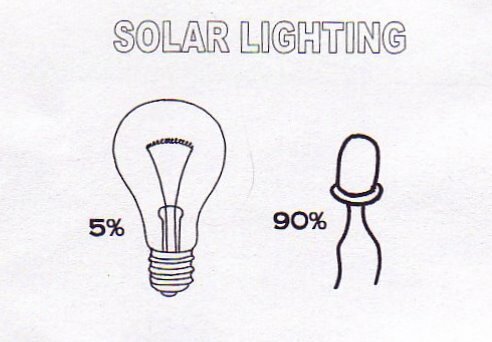 LED lights are very efficient for example a $400.00 solar panel would light a regular 100 watt light for 8 hours, where as a $40.00 solar panel would give you the same amount of light for 1/10 the cost and the LED lights, never wear out. Also a number of new televisions will be using these LED's which will cut the operating cost next to nothing. Note the ball of metal cut in half, reviving an old spark plug. What happens is that metals in the ocean like iron, rust, which creates electric currents. (that's how batteries work) These currents, then draw metals out of the ocean, like using electric currents to silver plating items. In this case the main metals are magnesium like car wheels and nickel which is worth real money and both metals can meet most of our needs. These balls of metals are scattered across the ocean floor, probably the result of meters over the ages. 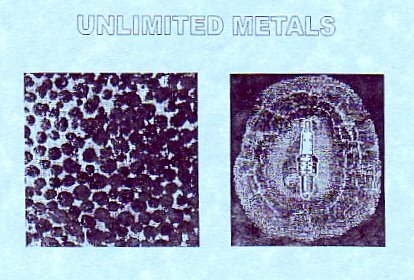 but also from the example of the spark plug, we know that we can use low cost metals to collect lager quantities of more valuable metals. There could be many small business opportunities here. It is amazing all the things at have been laid up for this New Kingdom Age and at a time when we are gaining the knowledge to start doing things right. There's lot's of oil around the world, but new energy sources will eliminate much of that need. Electric cars and conversion kits will be all over the place. Many new low cost homes designs that anyone can build in a few days will be on the market. Automated green houses, along with automated home cottage business will proved most of what one needs. High speed rail made possible by automated rail laying equipment will cress cross the nation in a years or two. Time on the job will be no more then a day or two. Just look around at all of the great new ideas and technologies. Farmers alcohol, Google printing press solar cells, The internet, Cars that run on compressed air, Diesels that run on 50% water, Diesel fuels squeezed out of plants or algae, Home heating and cooling systems using the Earth's stable 55 degree temperature, Using earth worms, Pebble ball reactors, windmill's, ocean currents and temperature differences, geothermal. There's are unlimited possibilities and no one should ever need to pay monthly bills. Today Japan has internet that is lower in cost and 20 times faster then in America and we are told that it may be 20 years before we can catch up. Why this delay, when we could have high speed internet all over the country in just a few months? Fiber optics cables are made of glass. Therefore they can be run right on top of the power lines that come into your home, without any interference. So start asking your power company for that service now. It will be good for you and our nation.